" Vintage Tractor Pictures " uniquely presented for the enthusiast. Most of the source material, sketches and photos, for these vintage tractor paintings, is taken from my collection of photographs taken while visiting vintage tractor ploughing matches, in various parts of England. The annual vintage tractor event calendar is avidly followed by enthusiasts, this artist being no exception. Vintage Tractors are an expression of our rural heritage, man and machine working together in harmony with the seasons. Through my vintage tractor paintings I try to convey the sounds, smells and raw emotion of half a century ago. Vintage tractor enthusiasts, worldwide, are collectors of this new and very popular art form. No longer just a poster to stick on the workshop wall, but a work of art to hang in pride of place, representing the vintage tractor enthusiast's favourite passion. If you have yet to start your collection, you should consider a Forster vintage tractor print - make out your birthday wish list and put one at the top. Happy birthday - best wishes from Tony Forster. 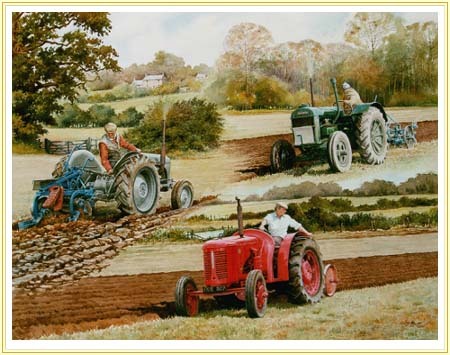 A selective look at the work of an artist, whose attraction to the agricultural machinery of yesteryear is so graphically apparent in the pictures exhibited here, one could be excused for thinking that he must work with the machines he so obviously loves to paint. The style, application and attention to detail that can be found in all of these images, make it easy to understand why this artist's Vintage Tractor paintings are so eagerly collected throughout the UK and abroad. Newcastle-under-Lyme gallery in Albert street. 29 Albert Street, Newcastle-under-Lyme, Staffordshire. ST5 1JP. by one of Britain's finest agricultural artists. Traditional Country Brown Walnut toned wood, edged with gold to complement the print, set within its own hand-decorated conservation quality mount, or if preferred, can be supplied mounted only.